Bugged by bugs in your home this winter? 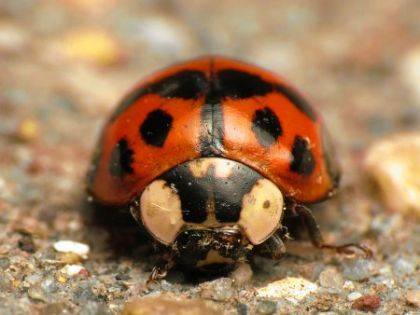 Come warm weather, it’s a good time to protect your home from fall-invading, winter-squatting insects, such as the multicolored Asian lady beetle shown here. COLUMBUS – If you spent the winter finding multicolored Asian lady beetles on your lampshades and/or brown marmorated stink bugs on your toaster, there’s bad news and good news. The bad news, say experts at The Ohio State University, is that Ohio’s colder than normal winter probably didn’t faze the creatures. When the winds blew, snow flew and temperatures fell below zero, they were mostly snug in your attic or walls, sheltered from the storm. That’s why they sneaked in to begin with. The good news is, with warm weather coming, they’ll be leaving your house to go back outside, and you can take steps to keep them out for good. “Spring and summer are a good time to bug-proof your home,” said Joe Boggs, entomologist and educator with Ohio State’s College of Food, Agricultural, and Environmental Sciences (CFAES). In Ohio and much of the United States, brown marmorated stink bugs and multicolored Asian lady beetles are common fall home invaders. They seek safe, secure places for spending the winter that are neither too cold nor too hot — an unheated attic, for instance. Michel, an entomologist, studies the stinkers because they can hurt soybeans and other crops. He said a worst case for “marmies” would be a prolonged warm spell in spring, which would cause them to go outside, followed by a long cold snap below freezing. “That would tend to knock back the population a bit, killing the ones that were early emergers and weren’t able to go back into hiding,” he said. But don’t count on it. If they bugged you last winter, he said, you might want to take Boggs’ advice. Multicolored Asian lady beetles, too, are apparently winter-tough. While “we don’t understand everything about them,” and their populations have fallen since the explosions of the 1990s, “the outside temperature doesn’t seem important in terms of their overall survival,” Boggs said.